blizz has succesfully made this game horrible and unpleasent to play now. after being apart of this community for 2 yrs or more, i have decided to stop playing this game, as it is no longer any fun. Garunteed to loose if you dont spend money. i go back to sc2 full time and laugh at all you idiots who continue to play a game that is not skill based and based soley on money spent. this game had alot of petential but unfortunately evey expansion this game gets worse and worse, this current season is pure rush style and 5 turn game now, absolutely pathetic blizz. well donr once again u ruined a brillient idea just like u ruined sc2 since the relaese of hots. 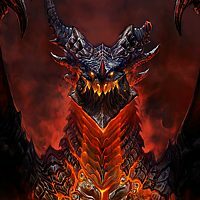 I hope one day blizz makes enough money so that they can get back to makeing good fair games, but im sure by then another gaming company will take this gap blizz provides and create a fiar game that blizz players will go to and forsake blizz for putting money before gameplay. 20 yrs i play blizz games, so dissapointed. The thing is that you don't have to spend money... You have to spend an enormous amount of money! Just to play a boring card game... LOL! Only Blizzard could do that. I have not spent a single euro on this game, totally free-to-play since I started, some 3-4 months ago. I enjoy it a lot, and take great pride in the progress I made since the beginning. I can assure you it is great fun to me and there are so many things I plan on doing; I take it slow and enjoy it better this way. I don't like the rush games, too, but I have to tell you that in my games, I don't meet them so much as to become a big problem. You see how different we are in how we enjoy a game, and what we want from it. So, please do not assume that the game is not "successful" or "boring" for everyone. How the ! @#$ it has to do with math? Are you braindead? You said it yourself... You played for 1,5 years and i'm pretty sure you are still missing a lot of cards... So for 1 year i have to play with lame decks and get destroyed by opponents with well paid decks, but this game is free to play, you are right dude. Just not true. Pirate decks are cheap. The only expensive part is to save dust for Patches to make them even more efficient. Actually, that's probably the reason why everyone plays those terrible pirate Warrior or Shaman decks and why 3 out of 4 games have become so boring and annoying and end on turn 4-6. 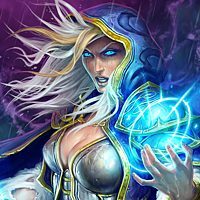 I would agree that Blizzard has ruined the game with the latest expansion but it's matter of bad game design, not of f2p vs p2w. Hi there, bronze, player. So you rage quiting a game because of not being good at it, makes us idiots? Insert time instead of Money. I try to make sure to complete every Daily quest I get. In time, I'll have enough to be able to compete. I'm in no hurry, I've been at it for some time. I ran a cheap face hunter some seasons ago and got to rank 5 (yea, I was part of that crowd) and I was able to gain some coin. Now I'm saving gold for the next expansion, hopefully I'll be able to get a deck that can compete that time. 1. You have a small collection of cards. 2. You lose a lot of games. Obviously, you face opponents who play cards that you lack. When losing a game, those are the cards you take special note of. The false conclusion you draw is the causality between your small collection and as a result losing a large number of games. Yes a bigger collection gives you more versatility, more synergy and eventually stronger decks. The result of this is a slightly higher winrate, and a more consistent winrate at high ranks. If you want to climb from rank 5 to legend, a heavily refined deck is recommended. This only accounts for the top 2% of the gaming population though. 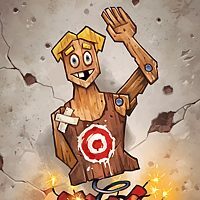 Rank 25-5 doesn't need a super high winrate, just over 45.2% to ensure slow climbing. Casual gaming doesn't need any winrate. 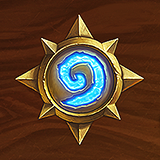 On fora, and community discussions, the Holy Grail of Hearthstone has been praised as "playing control decks". Control decks are really a niche section of deck building. Yes it requires a lot of rare tech cards, and often legendaries. People praise it as it usually has a big hand of choices, it responds, and has a lot of delays and tech options. It is considered "hard to play" and "skilled to play". The default or base strategy in Hearthstone is curving out though. Push value out on curve and outrun/overrun your opponent. Midrange and Aggro are the fast and slow variations on this approach. Tempo plays, curving out. Many "stuck" players wrongfully try to play control with a deck not suited for control, or not able to navigate the deck properly. 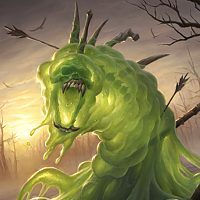 With the Basic card set, you can create fairly simply on-curve tempo decks or midrange decks. They focus on putting value (big bodies, or high volumes of minions) to the board on curve. Of course at high ranks these decks are difficult to perform with, but at lower ranks you meet a lot of people who make misplays, play less refined decks, or copied netdecks while not playing them correctly. I play accounts both with funding (and a decent collection) as well as F2P with a small collection. I can play on ladder with both, with any class. I do not aim to climb a lot on ladder with the free account (mainly use it to complete quests and practice arena with the gold), but I can fairly easily move to rank 20-15 with any class. I understand it is much more convenient to put the blame on money/collection. But if you keep losing over and over, buying loads of packages will not change this situation a lot. It will help a little, but your biggest gain will be to learn the meta, learn how to build decks, learn how to play your decks in specific match-ups etc. It's like learning to drive a car. You can blame all your collisions on not having enough money to buy a Tesla, or accept that learning to drive takes more than "knowing the concepts of 4 wheels, a brake and a steering wheel". Try to look up the Trump's old videos on basic teachings. They still hold value. The guy is a very skilled player, who can explain the core of the strategy in a very concise way. Build your own midrange decks and play value on curve.. and win games. This only accounts for the top 2% of the gaming population though. Yes a bigger collection gives you more versatility, more synergy and eventually stronger decks. The result of this is a slightly higher winrate, and a more consistent winrate at high ranks. Ok, I'm not at all a P2W ranter. The thing is, I payed a little bit on Hearthstone for packs, and I have a somewhat decent ish collection. The thing with this is, I have a heavily refined deck, and a really not at all refined deck. With the latter, rank 25-18 I get absolutely destroyed, stomped, rekt by heavily refined decks ( I perceive heavily refined decks as expensive af decks, usually 8k dust and up) and we're talking rank 25-18. With my heavily refined deck, however, I simply play casually against other strong decks, but I'm playing as an equal this time, not as a smaller player. My point here is that right now, in the ladder, all the way from rank 25 to legend the ladder is FULL of super expensive and refined decks. 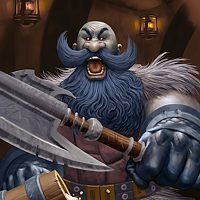 There are the no-brainer pirate and Jade decks, the you-need-a-minimum-of-10-brain-cells-to-play-this-deck decks, such as Renolock, where you only have to play on curve, dig for Reno and don't let your opponent develop anything, and there are the you-actually-need-a-brain-to-play-this-deck decks, pretty much all the Control decks. The thing is that for a fully F2P player, no viable option is available, as it is almost impossible to keep up with a deck with little to no Epics and no legendarys in the deck, against amazing legendarys with amazing synergy. 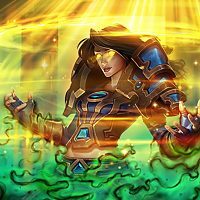 I am truly hoping that Blizzard will make F2P decks competitive again. I do not often recommend a youtuber for value input, but some videos are. Check this by Kripp, it is in line with what I tried to say. There's also literally nothing wrong with being efficient, employing some daring and deductive reasoning to map out the meta, figure out a deck or two to carry you through this meta, dust cards that have no value to you in regards to said decks and craft whatever you think you're missing to compete and regain your losses through higher win rates. The tools for creating the perfect deck (and just that) on a budget only demanding your time are present. 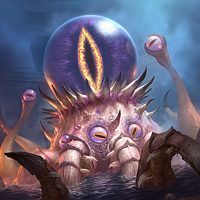 It's nobody else's fault but your own you didn't check if Hearthstone came with spare guts and a pair of balls to actually get up and dust those useless rares/epics that are just sitting in your collection and not seeing any usage. The amateur completionist might get antsy but the true completionist knows that greatness only comes through sacrifice. Lots of cheap decks that easily will get you far in the game.... some only requiring 1-2 legendaries. But sure lets trashtalk the game for your sake. Crapstone has always been this way. Luck and money, almost like a never ending roulette . people complaining about a 'Free-to-play' game being pay to win.